Botswana women’s volleyball team has been in training camp over the past week as it prepares for a grueling African Olympic Qualifier tournament to be played in Cameroon next month. A squad of about 18 players from four different league teams was assembled for the training routine that takes place every morning and evening at the Botswana National Youth Council (BNYC) Hall. As usual from over the past decades, top clubs Kutlwano and Mafolofolo with five players each dominate the number of call-ups with Kalavango and Dynamites each contributing three players. Tracy Chaba who has been playing for Abu Dhabi’s Al Wadha Volleyball Club also adds to the team that will eventually be trimmed to 12 players. 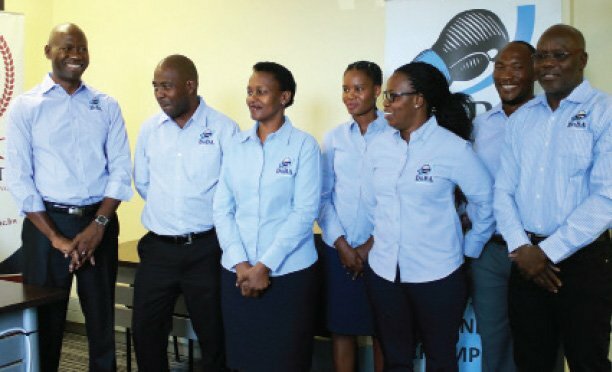 Botswana Volleyball Federation’s (BVF) Sports Development Officer Peaceful Seleka – who recently released the list of players called to camp – told Sun Sports this week that there could be changes in personnel as doubts still linger on the availability of some players for varied reasons. Seleka himself has been working with the team on the interim as the BVF awaits the release of appointed coaches who are yet to report for camp. The team’s head coach Manuel Torres is expected to arrive this week from Cuba while it is not clear when his assistants Kabo Ntshinogang and Gareanna Makgetha will be available as they still have to be released by their respective employers. The Olympic qualifiers’ tournament for Africa is set to begin on February 15 and will run until February 19 in Cameroon’s capital of Yaounde where the ultimate winner will gain automatic qualification for the Rio showpiece. Teams finishing in second and third places will have another chance to proceed to Brazil through participation at a second World Qualification Tournament that will include countries from all participating continents. Each continent will have a single automatic qualifier from winning their respective continental qualifier tournaments, with the five continental winners joining hosts Brazil as well as China who qualify by virtue of being 2015 FIVB Women’s World Cup winners. Another team that has already qualified is Serbia who gained the automatic slot after emerging runners up at last year’s Women’s World Cup in Japan. Continental qualifiers for Europe, North America and South America were decided at their tournaments that concluded over the past weekend – with Russia, USA and Argentina emerging winners for the said continents respectively. In all, a total of 12 teams will compete at the Rio games and only six slots are yet to be filled. Only Asia and Africa are yet to decide their automatic qualifying countries. The remaining four places will then be fought for by runners up and third-place finishers from the continents at the World Olympic Qualification Tournament set for the period between May 14 and June 5. At the Cameroon tournament, Botswana will find other sixteen nations lying in wait, among them traditional powerhouses Tunisia, Kenya, Egypt, Algeria and the hosts. Other nations include Nigeria, Ghana, Cape Verde, Uganda, Mozambique, Gabon and Burkina Faso. The last two automatic qualification spots for Beijing 2008 and London 2012 Olympics were snatched by Algeria. It thus remains to be seen how the Botswana women will negotiate their way past these giants of African volleyball after years of playing second fiddle. But the local team’s captain Tebogo Sejewe has expressed confidence in her team’s readiness, saying most in the camp are experienced players who finished in the top four at the All Africa Games last year.